Flip a coin. 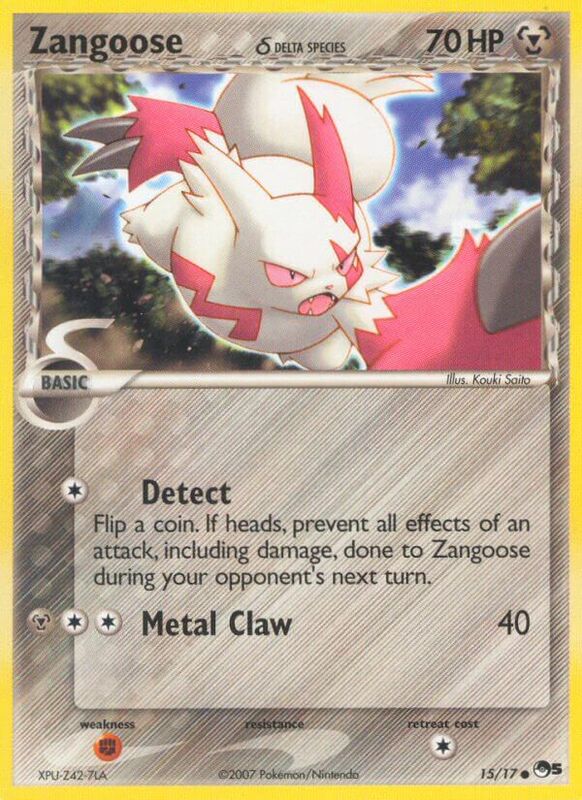 If heads, prevent all effects of an attack, including damage, done to Zangoose during your opponent’s next turn. 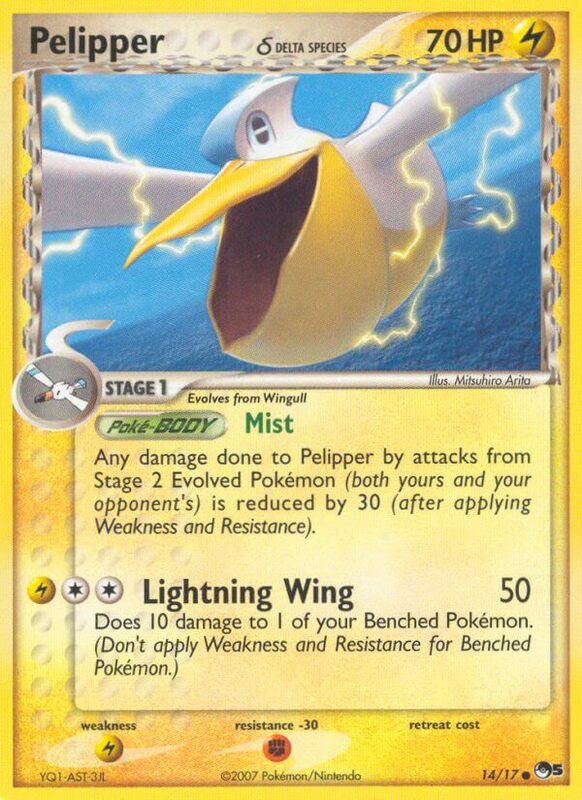 Any damage done to Pelipper by attacks from Stage 2 Evolved Pokémon (both yours and your opponent’s) is reduced by 30 (after applying Weakness and Resistance). 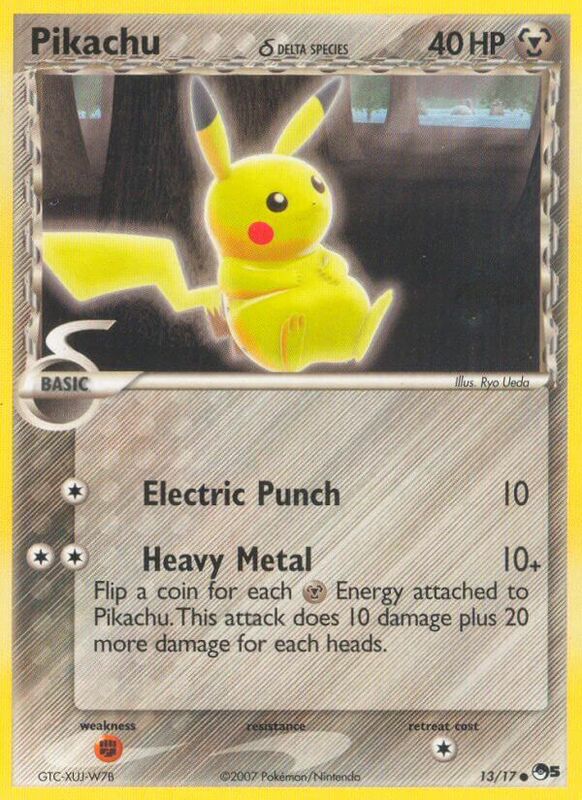 Flip a coin for each [M] Energy attached to Pikachu. This attack does 10 damage plus 20 more damage for each heads. Choose 1 of your opponent’s Pokémon. This attack does 10 damage to that Pokémon. This attack’s damage isn’t affected by Weakness, Resistance, Poké-Powers, Poké-Bodies, or any other effects on that Pokémon. Flip a coin. 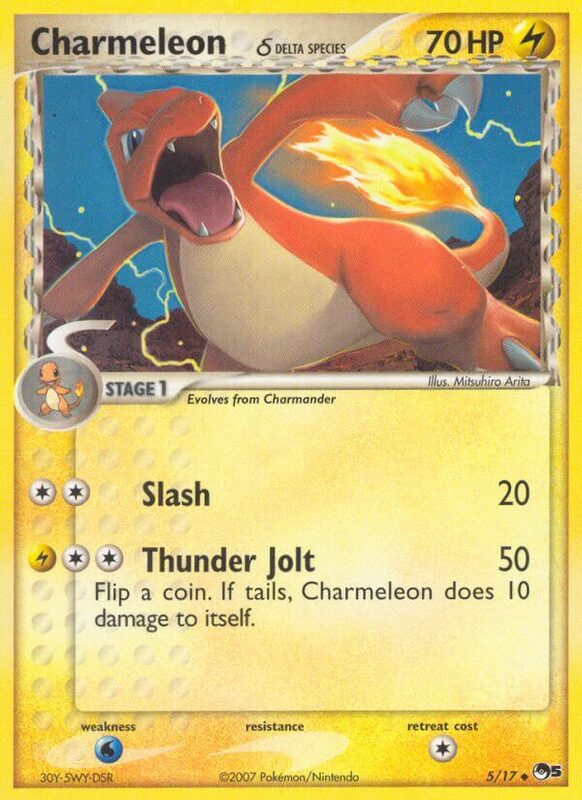 If tails, Charmeleon does 10 damage to itself. Choose 1 of the Defending Pokémon’s attacks. Copy copies that attack. 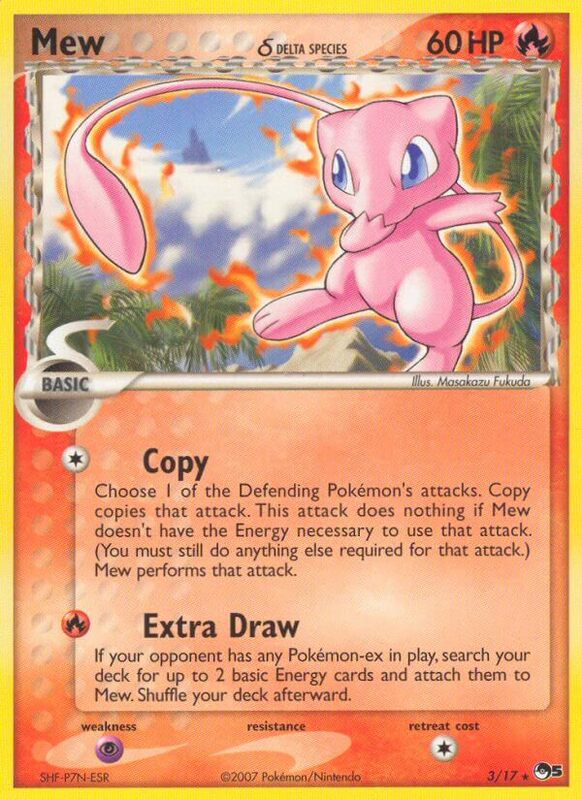 This attack does nothing if Mew doesn’t have the Energy necessary to use that attack. (You must still do anything else required for that attack.) 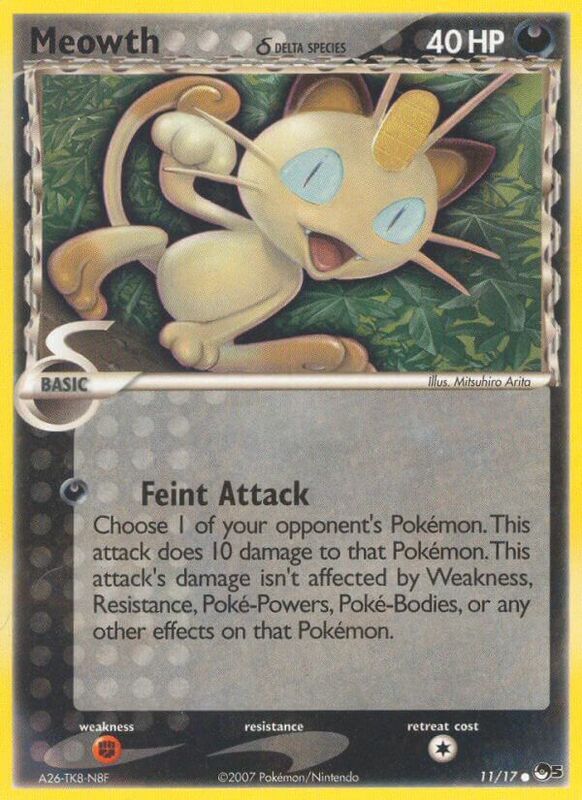 Mew performs that attack. Choose an attack on 1 of your opponent’s Pokémon in play. Mimicry copies that attack. 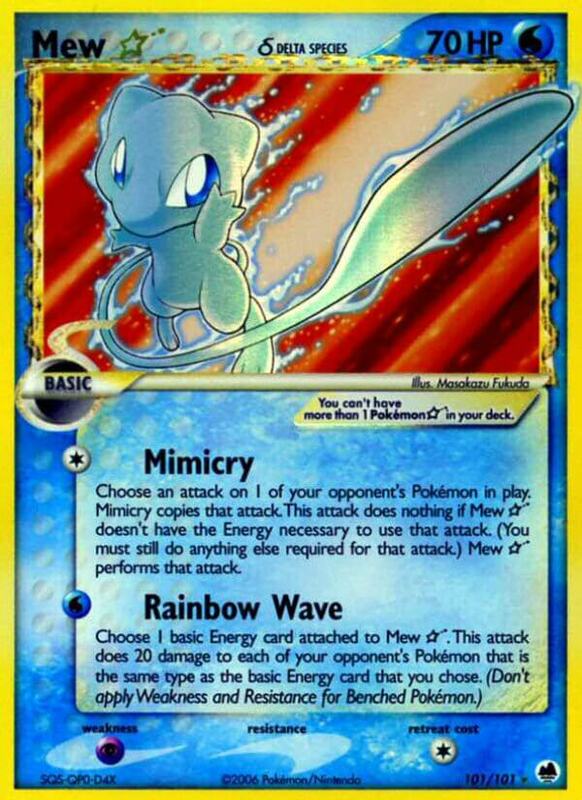 This attack does nothing if Mew Star doesn’t have the Energy necessary to use that attack. (You must still do anything else required for that attack.) Mew Star performs that attack. You can’t have more than 1 Pokémon Star in your deck. 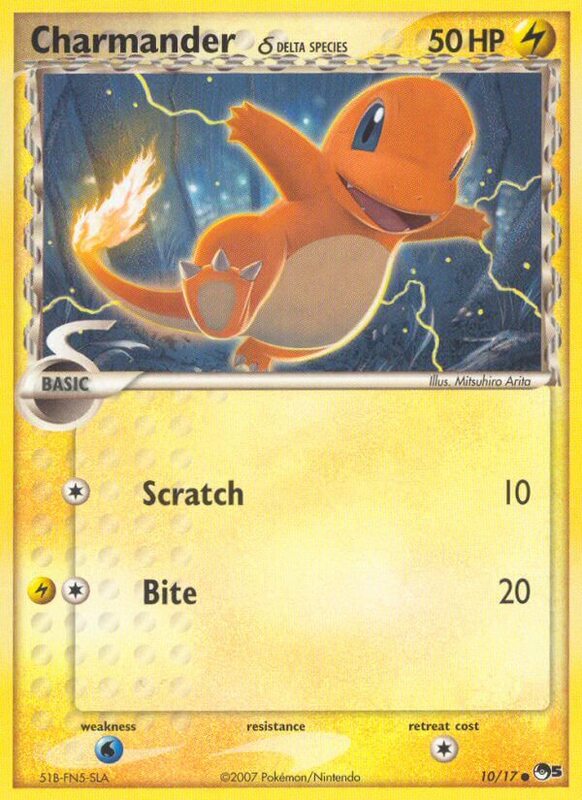 You may discard an Energy card attached to Charizard Star. If you do, search your discard pile for an Energy card (excluding the one you discarded) and attach it to Charizard Star. 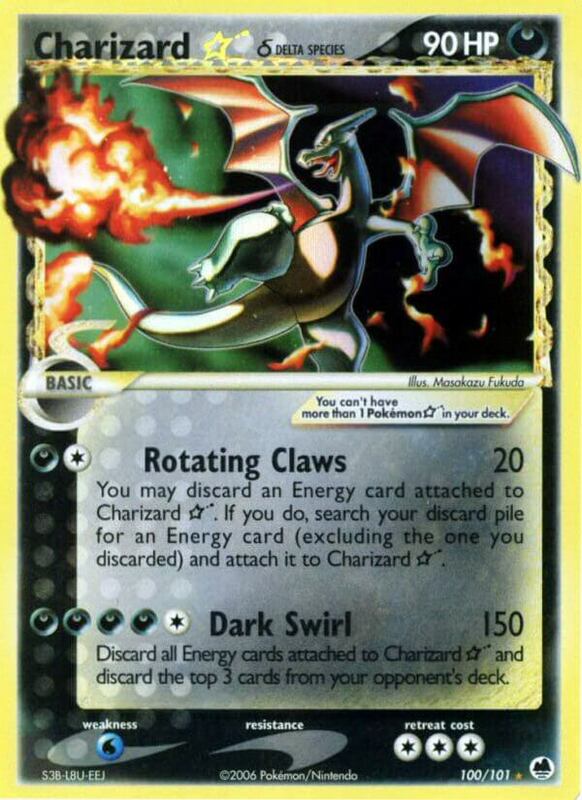 Discard all Energy cards attached to Charizard Star and discard the top 3 cards from your opponent’s deck. 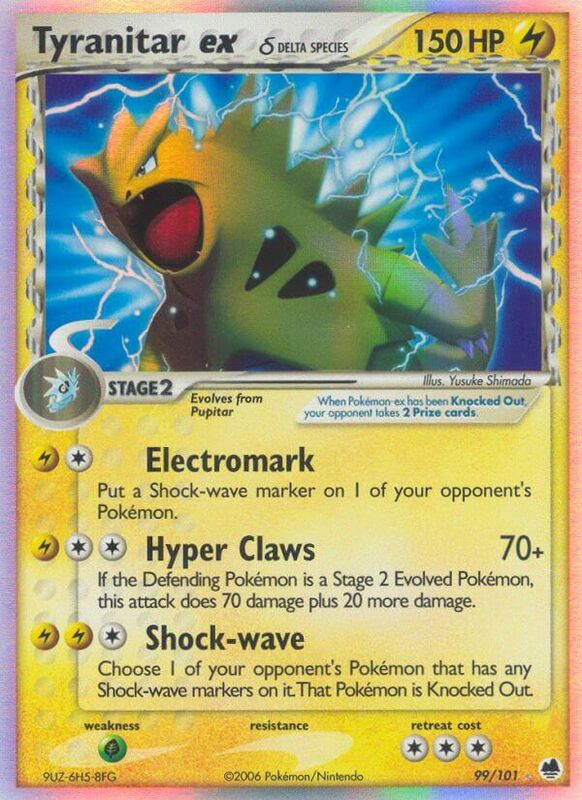 Put a Shock-wave marker on 1 of your opponent’s Pokémon. 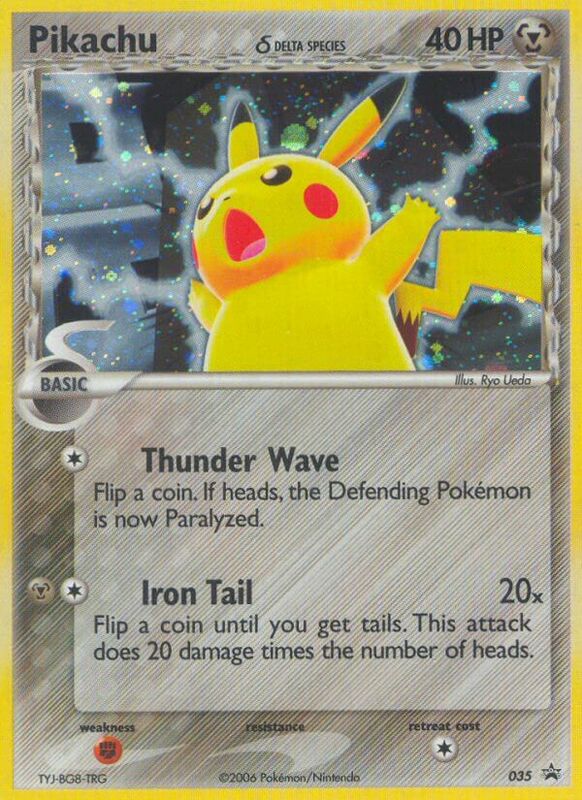 Choose 1 of your opponent’s Pokémon that has any Shock-wave markers on it. That Pokémon is Knocked Out. Once during your turn (before your attack), you may use this power. 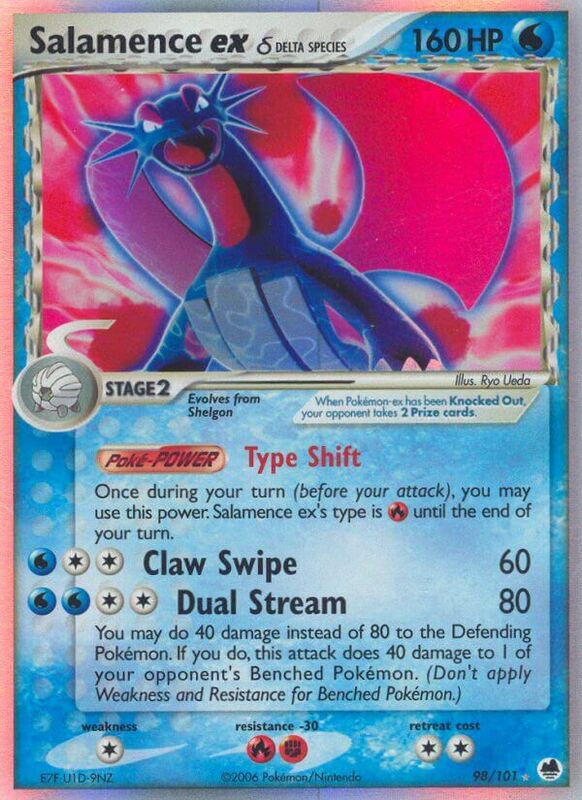 Salamence ex’s type is [R] until the end of your turn. 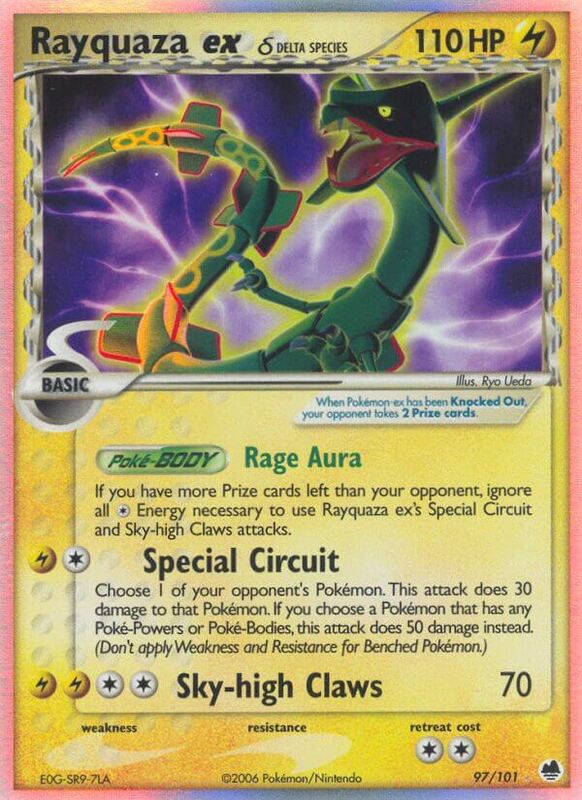 If you have more Prize cards left than your opponent, ignore all [C] Energy necessary to use Rayquaza ex’s Special Circuit and Sky-high Claws attacks. The Retreat Cost for each of your Latias, Latias ex, Latios, and Latios ex is 0. 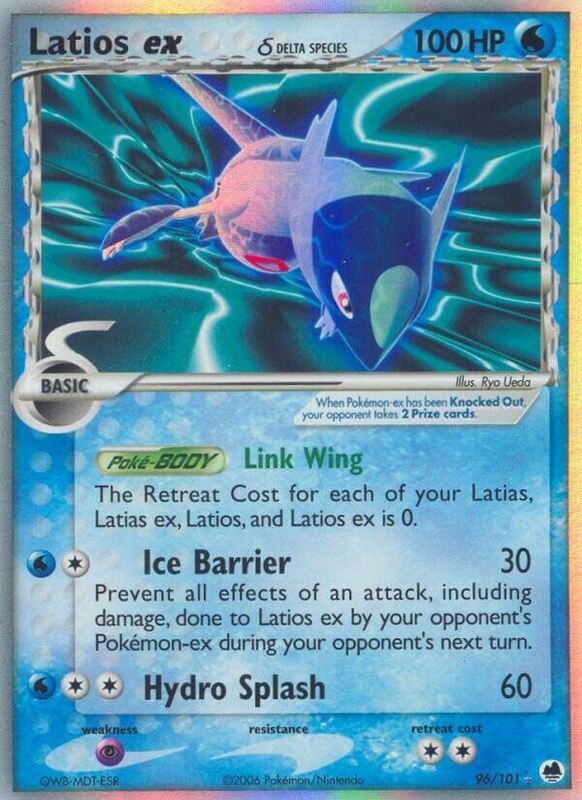 Prevent all effects of attack, including damage, done to Latios ex by your opponent’s Pokémon-ex during your opponent’s next turn. Once during your turn (before your attack), you may attach a basic Energy card from your hand to your Latias, Latias ex, Latios, or Latios ex. If you do, your turn ends. 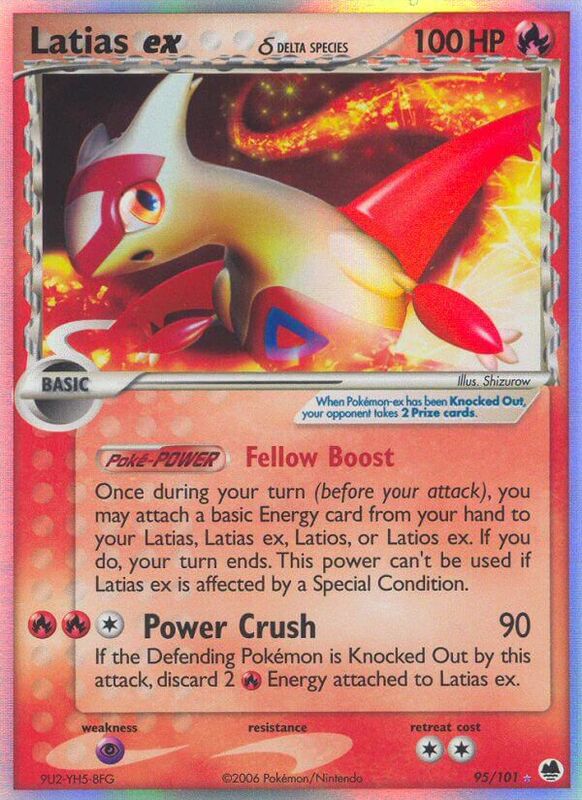 This power can’t be used if Latias ex is affected by a Special Condition. If the Defending Pokémon is Knocked Out by this attack, discard 2 [R] Energy attached to Latias ex. Any damage done to your Stage 2 Pokémon-ex by your opponent’s attacks is reduced by 10 (before applying Weakness and Resistance). 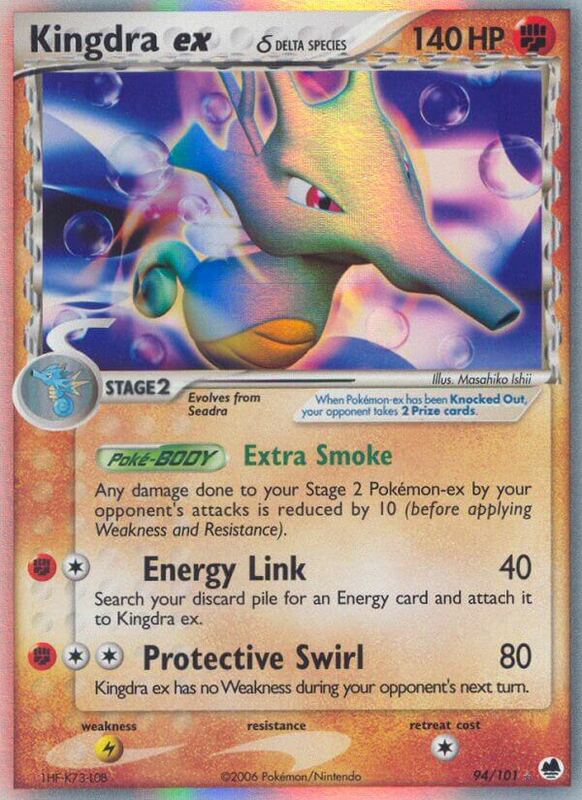 Kingdra ex has no Weakness during your opponent’s next turn. 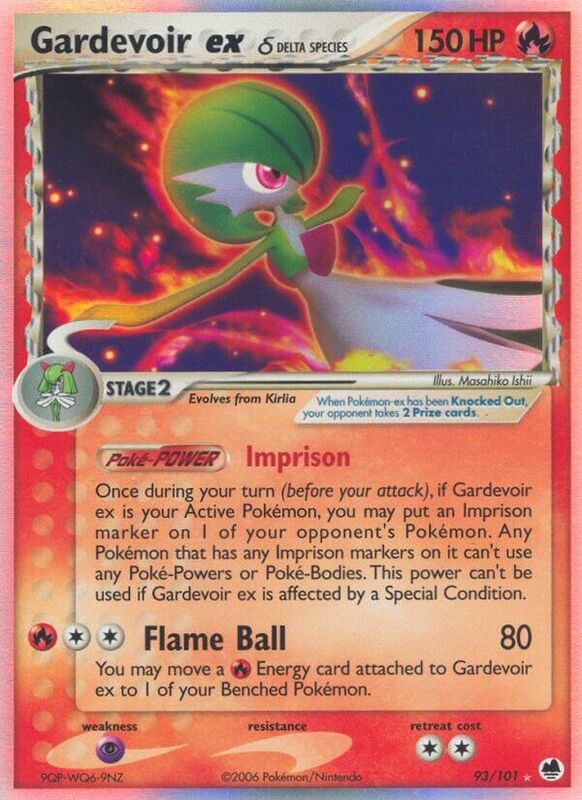 Once during your turn (before your attack), if Gardevoir ex is your Active Pokémon, you may put an Imprison marker on 1 of your opponent’s Pokémon. Any Pokémon that has any Imprison markers on it can’t use any Poké-Powers or Poké-Bodies. This power can’t be used if Gardevoir ex is affected by a Special Condition. You may move a [R] Energy card attached to Gardevoir ex to 1 of your Benched Pokémon. 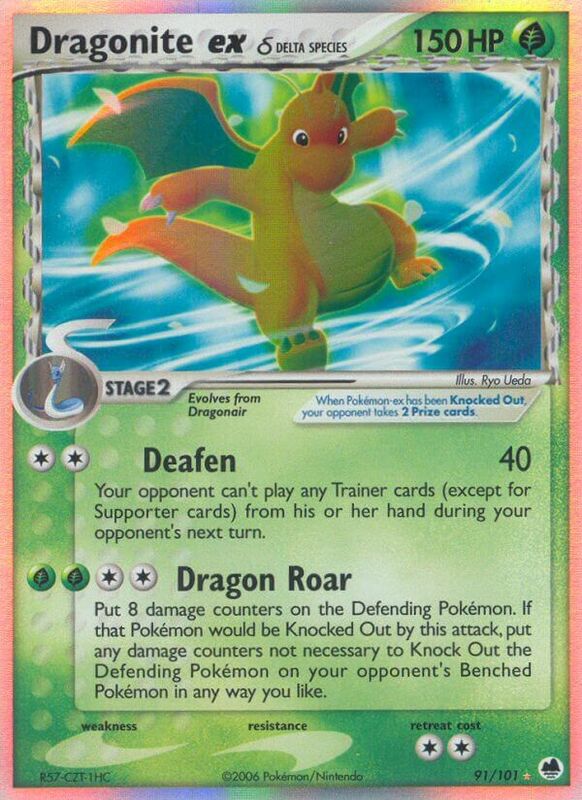 As long as Flygon ex is your Active Pokémon, put 1 damage counter on each of your opponent’s Benched Basic Pokémon between turns. 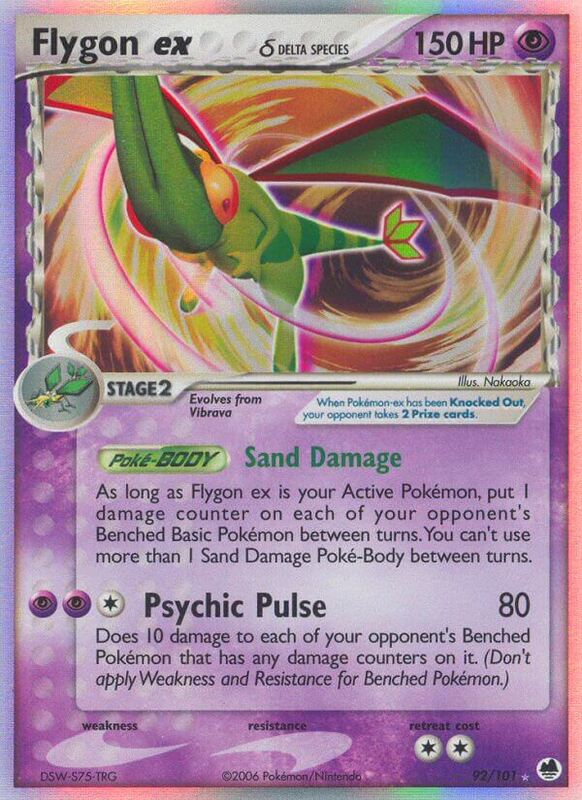 You can’t use more than 1 Sand Damage Poké-Body between turns. Your opponent can’t play any Trainer cards (except for Supporter cards) from his or her hand during your opponent’s next turn. Put 8 damage counters on the Defending Pokémon. If that Pokémon would be Knocked Out by this attack, put any damage counters not necessary to Knock Out the Defending Pokémon on your opponent’s Benched Pokémon in any way you like. Once during your turn (before your attack), you may attach a basic Energy card from your hand to 1 of your Stage 2 Pokémon-ex. 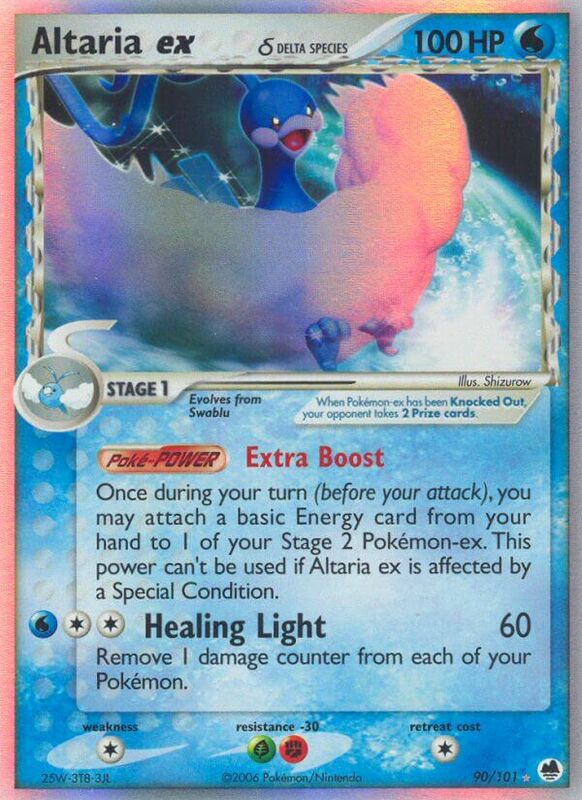 This power can’t be used if Altaria ex is affected by a Special Condition.